After a little shopping and midday dinner with the Orrs, Evelina, Oakes and Melinda Orr drove to Mt. Auburn Cemetery, a new-style burial ground on the Cambridge side of the Charles River. Fashioned somewhat after the Pere Lachaise Cemetery in Paris, the twenty-year old cemetery had been the brain child of, among others, a Boston physician named Jacob Bigelow who felt that the practice of burying the dead under and right next to churches and meeting houses was unhealthy. With the encouragement of the Massachusetts Horticultural Society and a designation of 70 acres from the Massachusetts legislature, Mt. Auburn Cemetery was created. By carriage and on foot, Oakes, Evelina and their friend Melinda were able to go “most all over the grounds,” seeing paths, plantings, monuments and the Bigelow Chapel. They saw other landscapes of greater Boston today as well, including the brand new Brookline Reservoir. *Pilgrim’s Path, Mt. 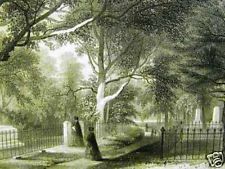 Auburn Cemetery, 1851. I may have already mentioned this, but when Old Oliver’s wife and siblings start dying, he explores Mt Auburn and Forest Hills as models for his own burying ground. He eventually settles for the one across from Stonehill on Rt 138, but it isn’t long before his children move his and other remains, from there into their own special one in North Easton, tucked in between the Church and the (now demolished) Hoe Shop. Interesting that Old Oliver considered Mt Auburn as a graveyard for the family, but opted to stay in Easton. You’re right that his family – Oliver Ames Jr., in particular – created their own family cemetery behind the Unitarian Church that Oliver Jr funded and had built in 1875. Most family members who had predeceased the creation of that Unitarian cemetery ultimately were moved there. Oliver was looking for models for his burying place. I never saw any evidence that he ever considered actually burying his people anywhere outside of Easton..
Dwight – Thank you for the clarification!